The Parlament de les Illes Balears will hold its last session of the current legislature tomorrow, March 28th. After that, the Balearic parliament with be adjourned due to the upcoming regional elections being held on May 22nd, 2011. Parliamentary sessions are usually open to the public, subject to prior registration. Seats are limited, however. During the Summer recess, guided visits will be on offer, most likely in May when the anniversary of the Balearic constitution will be celebrated. The parliament is housed in what used to be the Círculo Mallorquín building, a club for the upper-class social circles of Mallorcan society during the 19th and early 20th century. When the Illes Balears gained autonomous status in 1983, the building was acquired to house the new autonomous parliament. The erstwhile Salón de bailes y conciertos (ballroom) of the old Círculo Mallorquín is now the plenary assembly hall, a beautiful space which was originally designed by Mallorcan artist, Ricardo Anckermann Riera. 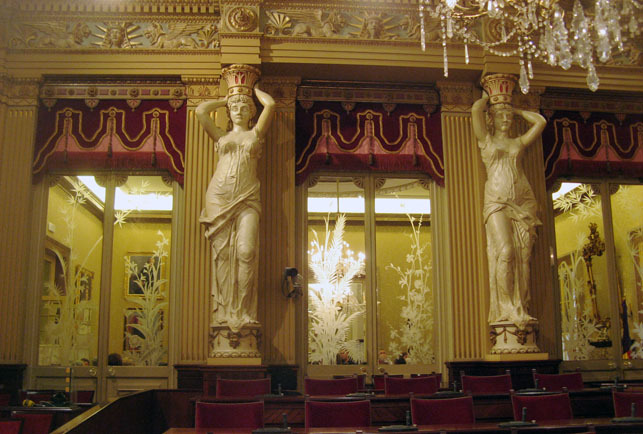 The room also used to be called Sala de les Cariàtides in reference to the exquisite marble statues shown in my photo. I would suggest you visit the splendid building if ever you have the opportunity. The photo was chosen from my archive. It was taken in Palma de Mallorca, Baleares, Spain. The date: May 23rd, 2008. The time was 14:58:08.